The chairman of Kumho Asiana Group, which owns the nation’s second-largest air carrier, apologized Wednesday for causing public concern amid escalating controversy over operating passenger flights without meals and a questionable deal behind it. Offering an official apology, Chairman Park Sam-koo said he was sorry for causing concern and that he feels “grave responsibility” for causing customer inconvenience. “I feel greatly responsible for having caused such troubles to the customers and our employees by having failed to make due predictions and preparations,” Park said in an emergency press conference, flanked by his executives. He also apologized to the bereaved family of a CEO of Asiana’s subcontractor who was found dead in apparent suicide on Tuesday. 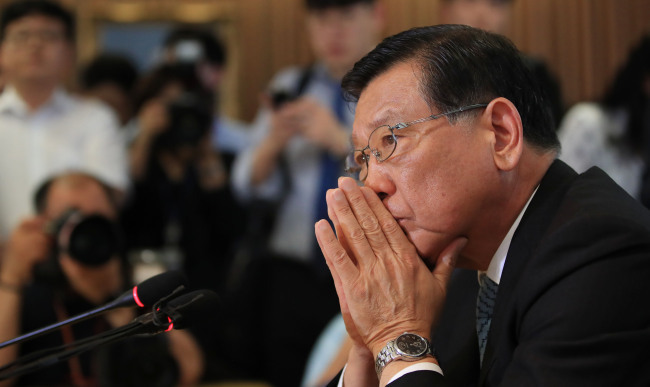 Park’s apology came amid intensifying criticism of the management of Kumho Asiana for its suspicious deal in the process of changing its inflight meal supplier. Industry insiders said that the fiasco started after Asiana terminated a 15-year-old deal with LSG Sky Chefs, a subsidiary of German airline Lufthansa, and inked a contract with GGK. GGK is an in-flight catering service firm Asiana jointly set up with China’s HNA Group. Starting from July, Asiana was to receive GGK in-flight meals for the next 30 years. Some insiders have claimed that the 15-year-old partnership with LSG ended after Kumho Asiana reportedly demanded the German company acquire 160 billion won ($142 million) worth of bonds issued by Kumho Holdings to secure their contract with the airline. At the time Asiana was seeking to secure capital to buy back Kumho Tire. LSG, which had 70 percent of its revenue relying on the deal with Asiana, has since filed a complaint with the Fair Trade Commission with the claim in April. Asiana Airlines refuted the allegation and said that its deal with GGK was more favorable to the carrier. Meanwhile, a group of Asiana Airlines employees said they would hold a sit-in protest in Gwanghwamun for three days starting Friday, to disclose Chairman Park’s alleged wrongdoings. They hold Park responsible for the so-called “no-meal fiasco,” that it resulted from his attempt of “seeking personal interest” and “providing unfair support to a Kumho affiliate.” Chairman Park had making all efforts to bring back Kumho Tire, former cash cow, to the conglomerate. Due to lack of capital, his attempt failed, as creditors turned the tiremaker to a Chinese company. Park, one of five sons of Kumho founder late Park In-cheon, became the chairman of the group in 2002. He is also known as a respected patron to Korean artists, by expanding the mecenat movement aimed at encouraging corporate support of the arts.